Have you ever felt fed up with being tired every day, and yearned to spend more time sleeping in each morning instead of rushing to school? Maybe you’ve been finding that you just keep getting caught in exasperating peak hour crowds or jams every time you head home, or perhaps you’re having a gathering in some far flung place, and you’re wondering how best to get there. But with all the different transport apps and sites, it’s often hard to parse all that information. Just a note: arrival times aren’t available for the Downtown Line. Also, arrival times are given for all trains at a station, instead of the specific time for the train heading toward your destination, but it’s just a tap back to check the train map, so it’s not too much trouble. To take care of the next leg of your journey after alighting, railrouter.sg is good for a general map of where each station’s exits are located (though it misses out the LRT lines), and does mark out where nearby bus stops are too. For more specific information, check out the operators’ individual apps: SMRTConnect (iOS, Android) provides very detailed station information for the East-West, North-South, and Circle lines, including whether or not bicycle racks and ATMs are available, and even pictures that show you views of each exit. SMRTConnect’s station map also shows rough placements of wheelchair access ramps, lifts and taxi stands, and more information on accessibility can be found here For the Downtown, Northeast and Sengkang & Punggol LRT lines, SBS’ iris app (iOS, Android) maps out exit placements too, and is nicely detailed in providing information on lift access and which exits lead to taxi stands. Both apps also handily provide a list of surrounding landmarks for each exit. One catch with trains is that you might have to squeeze among crowds, but MyTransport.sg’s Station Usage site can help you sidestep these peak periods, perhaps leaving you with a seat to nap or get some homework done. The site calculates passenger traffic by counting how many people tap in and out of each station, and when you to combine that with the info given about train frequencies, it allows you to get a better estimate of how crowded the trains will be. Finally before you set out, breakdown updates: SMRTConnect and iris each have inbuilt notifications, and you can also check SMRT’s and SBS’s twitter accounts. Looking to the future, Singapore’s rail network’s going to expand quite substantially over the coming decades and make trains even more convenient for getting around, and the most immediate additions will be Downtown Line Stage 3 in 2017, and the Tuas West extension by this year (see here for their locations) so do keep a lookout for those! When it comes to how crowded a bus is, the Transitlink app comes in handy again with colour-coded information on how much room’s left. The wheelchair icon also lets you know if the coming bus is wheelchair accessible. Finally, to keep abreast of any (rare) breakdowns or route changes, SMRT updates can be found here, while for SBS buses you can again check twitter or iris. Cars usually stand out as being faster and more direct than public transport, nicely freeing up time for you while the guaranteed seat lets you have a chance to nap. But the ‘faster’ bit often gets compromised with traffic jams, especially during morning and evening peak periods. To get around these, your could introduce your parents to MyTransport.sg (iOS, Android). Its Traffic Smart function provides a clear overview of traffic conditions across Singapore, highlighting road segments where traffic is slowed, and including overlays of useful details like roadworks locations. This combined with up-to-date feeds from traffic cameras lets you plot routes around jams. It also complements train trips by listing any Park & Ride carparks nearby each train station. The Park & Ride scheme makes combining public transport with car travel easier with its ‘P&R set’: a monthly $40 card for bus, train and LRT rides, with a $30 season parking ticket valid for selected P&R carparks – a more affordable option than conventional season parking. An important concern with cars though is pollution, with their emissions per person being much higher than public transport, cycling or walking. By carpooling however, less cars will be on the road while still letting more people get around, which not only helps split travel costs but also minimises jams and lowers carbon footprints. In addition to asking classmates and friends if they’re open to carpooling, there actually exist plenty of services that facilitate ridesharing in Singapore. These range from ones that let you (or your parents rather, can’t drive till you’re above 18) rent cars at pickup locations all around the city: Car Club, Whizz Car, Tribecar, and smove among others, to services that literally let you share rides, whether as a driver or passenger: iCarsClub, ShareTransport.sg, carpool.sg and so on, and recently launched Grabhitch and Ryde. Of course, there’s also that oldest carsharing service of all: taxis. A quick phone call away, taxis are handy if you need to get somewhere at short notice (read: late for morning exam), but we often don’t remember the numbers or know if there’s a taxi stand nearby. The MyTransport.sg app again takes care of that with it’s convenient listing of all taxi operator numbers and taxi stands, while taxirouter.sg displays not only taxi stand locations but also where the taxis themselves are, letting you see where the stationary cabs around you are. As we know though, taxis have been facing rising competition from ‘taxi’ apps like Uber and GrabCar. Aside from being exciting options for the adventurous, these may be cheaper than taxis: according to this analysis by AsiaOne, GrabCar’s best with traffic jams, Uber after midnight (especially helpful as most public transport would’ve ceased), and taxis outside the peak hours and before midnight. Ultimately though, which option is best for you depends on your specific destination and when you’re travelling, and the many choices above mean that you’ll almost certainly find something that’s convenient for you! Of course, cars still can’t beat bicycles at being green, and cycling could also be an option on your mind especially with ODAC’s Gear Up 2016 having just recently concluded, and indeed it’s a great way to get some exercise and fresh air. A oft-raised concern though is the safety of road cycling. While there are cyclists who regularly commute to work on the open road, accidents do occur from time to time, especially as Singapore’s road infrastructure is not yet entirely adapted to be cyclist-friendly. This makes it all the more important to take responsibility for your own safety when cycling. This guide by the LTA gives you an easy-to-read overview of the basics of safe urban cycling and bike ownership in Singapore, while the Sports Council’s comprehensive Safe Cycling Guide take you through the safety concerns you should look out for, from choosing a bike to proper cyclist conduct. Local cycling blogs abound too, with the helpful community sharing tips and experiences aplenty to ease you into cycling around Singapore. Additionally, the infrastructure situation is improving, with increasing bicycle parks and bicycle road crossings, more Intra-Town cycling networks being rolled out, and existing Park Connector Networks being expanded. This is also accompanied by new legislation, with the government recently accepting guidelines for bicycles to more safely share pedestrian footpaths possibly by end-2016, and implementing the Walking & Cycling Plan requirements from this July to ensure property developers account for cyclists’ needs, while a half-day Safe Cycling Programme is being gradually rolled out over this year. A fully cyclist-friendly Singapore won’t happen overnight, but these certainly mean there’s growing room for you to cycle safely and conveniently. Also, foldable bicycles have been allowed on trains and buses for awhile now (guidelines here), nicely expanding your options. As for those new bicycle parks at stations, the MyTransport.sg app handily has icons beside station names to indicate that you can park your bike there, and even specifies the capacity at each station, while local cyclists have also taken the initiative to launch their own crowdsourced SG Bicyle Parking Project here which you can update too. All in all, with the increasing infrastructure for cycling, the helpful cyclist community, and the right safety precautions, cycling is proving to be a good option that you should seriously consider. Last, but not least, the trusty walk. It may not be the fastest or the most effortless, but it’s certainly one of the most flexible since you set both the pace and direction, if you set a direction that is – simply wandering and exploring is an open to you too. On an emotional level, a walk is also calming, and can help lift your mood when you’re stressed out, as walking has a way of clearing your mind, letting you slow down as you take in what’s around you. On that note, it’s also one of the best ways to really explore new places, or see old places in a new light. Crowsflight (iOS), is an intriguing app that helps facilitate that process of discovery. Enter your destination in Crowsflight, and it’ll simply point you in its direction. No messy, complicated details about what buses you have to take, how many minutes it’ll take you, or in how metres you’ll need to make a left turn. All you have to do is get walking, and which paths you take, what you stumble upon, what you discover as you go – it’s all up to you. Let’s say you’d like to walk to Tokyo. Simply key it in Crowsflight, and the yellow band points you toward your destination using your phone’s compass, while the blue circle and number in the centre display the distance to your destination. Should you happen to find yourself seriously lost though, or if you’d rather simply wander and find your way back home later, the free maps.me app provides a solid offline map experience. It allows you to pinpoint your location on a map, and it’s faster than loading a map over data while also being light on phone memory: the Singapore map is only 7MB, including routing information. Some minor inaccuracies do occur given that their map is open source from OpenStreetMap, but if you find any errors, you can correct directly any errors using that link, and really it works more often than not. Ultimately perhaps, as with walking and wandering, there’s a kind of serendipity that runs through all this exploration, as one tries out carpooling, biking, or a new bus route, seeing what discoveries may unfold, where life’ll take us. It’s a little ironic since all this isn’t exactly fresh exploration, given that we’re going down paths already virtually scouted out before on our screens. But really, there’s still a lot we don’t know for sure isn’t there? What we’ll see on the train ride that day, how your carpool ride conversation will go. 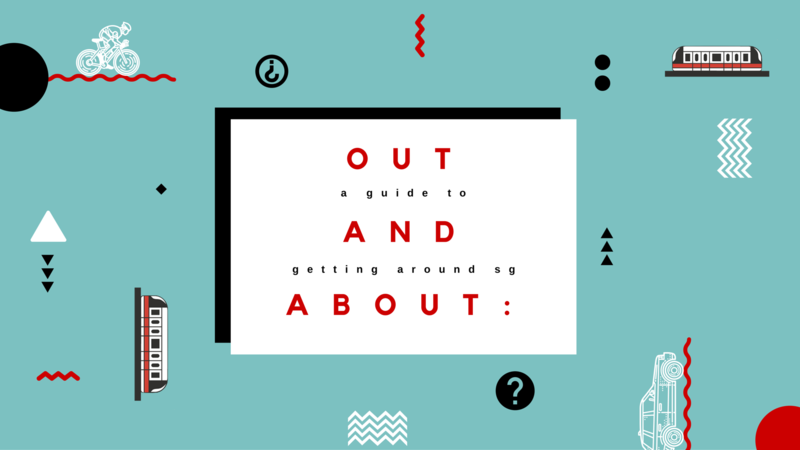 Maybe all these things we find out beforehand are actually more of stepping stones to new discoveries and surprises – and hopefully, that’s what this guide’ll be for you. Happy exploring!